A bit further down this post is a translation of a joint declaration of the assemblies of Sol in Madrid and Syntagma Square in Athens. This kind of articulation of common solidarity across international borders in a direct challenge to the European political and economic system cannot possibly interest anyone in Ireland, because it is not as if Ireland is being destroyed by politicians acting in connivance with bankers and European policy elites. Besides, there is a Presidential election coming up in October. 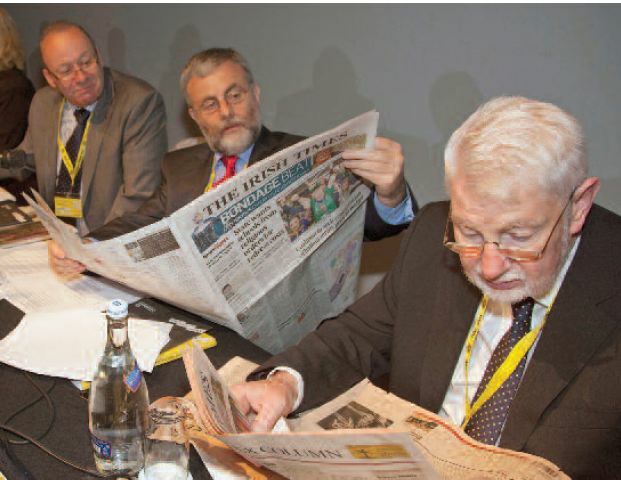 More pressingly, Fianna Fáil need to realise they’re no longer relevant. 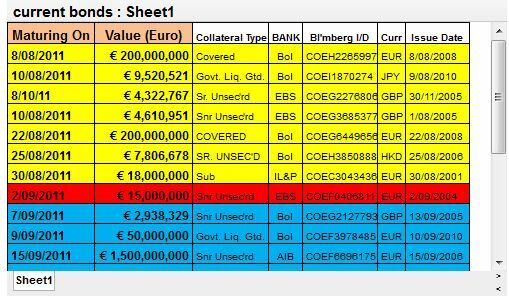 There is an orderly schedule of bondholder repayment. It would be wrong to question this. If public money that could be used to pay for schools and hospitals is being handed over to wealthy investors, then there is probably a very good reason for it. It will be grand. I don’t know about you, but I am more worried about the cost of sick days to business, which I heard about the other day in a news report based on a press release from the bosses’ organisation. And it worries me that people in Spain are out mobilising for a week of action against a constitutional change that would introduce a debt ceiling and institutionalise neo-liberal economic policy. What sort of message would that send out to the markets? To this end, France and Germany agreed to take the lead on closer fiscal coordination by: (1) enshrining a debt brake in their respective national constitutions and push for similar throughout the euro-zone, and; (2) harmonising their corporation tax rates and bases. Ireland would have suspected that the corporation tax issue had fallen away following the agreement made at the July 21 summit, but it has now reared its head again less than a month later. On the former issue, Ireland and, indeed, Greece and Portugal, are all unlikely to have major problems with enshrining a debt brake into their national constitutions, given that these countries have little control over fiscal policy at this stage in any case. Sure we can’t afford not to put the debt brake into the constitution in case it makes our European partners angry. So it’s probably best not to think about it at all. And moreover, there is real movement toward a change of direction in Ireland, with local solutions being proferred to local problems. Run out of money to feed the children? The Labour Party minister thinks you should go to St. Vincent de Paul. They’ll sort it out. So there is no need for anyone to think about political solutions or collective action of any sort, and certainly not in terms of taking to the streets. In another ten years time we’ll look back on this and laugh. Clearly Ireland is better off out of this. These people are only embarrassing themselves. Can you imagine if an Irish assembly had appeared in this declaration? God, that would be morto. 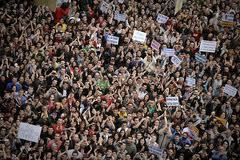 The Citizens in Sol and Syntagma express our outrage and we invite all those outraged in every square to join us. From the US to Brussels, from Greece to Bolivia, from Spain to Tunisia, the crisis of capitalism is worsening. And those who caused it are the ones imposing their prescriptions for overcoming it. These are: channelling public funds into private financial entities and making the public pay the bill with austerity plans which do not take us out of the crisis but rather sink us deeper into it. In the European Union, the attacks on sovereign debt by the financial markets submit cowardly governments to blackmail and hold parliaments hostage, who in turn adopt unjust measures behind the backs of the people who elected them. European institutions, far from taking firm political decisions in the face of the attacks by the financial sharks, align themselves with them. Since the beginning of this crisis we have witnessed the attempt to convert private debt into public debt: an example of outrageous socialisation of the losses after scandalously privatising the profits. The high interest rates charged to those of us who obtain funding have nothing in the slightest to do with our solvency, but with the speculative manoeuvres carried out by large financial corporations, in connivance with ratings agencies, in order to enrich themselves. Economic cutbacks have been accompanied by restrictions on democratic freedoms. Among these, the measures of control and expulsion of the migrant population and the restrictions on the free movement of Europeans through the European Union. Only the euro and the free movement of speculative capital enjoy open borders. In the Spanish State we are being collectively defrauded. Public debt (60% of GDP) IS NOT A PROBLEM but nonetheless they use this as an excuse to make us believe that a grave situation justifies the grave attacks on our rights and collective wealth, attacks they threaten to escalate. On the other hand, private debt (240% of GDP) is a problem, and instead of applying austerity measures to the banks, they are given all sorts of assistance and sinecures at the cost of the public purse. The greatest “assistance” is the transfer at knockdown price of nearly half our system of savings banks, as well as profitable enterprises and activities. Meanwhile, access routes to the Puerta del Sol, the epicentre of 15M, are closed, in violation of various fundamental rights. In Greece, they have imposed a Memorandum. They have told us that the cutbacks, the austerity and the new taxes on the population are necessary sacrifices to take the country out of the crisis and bring the debt down. They have lied to us! Each day they take new measures, salaries are slashed, unemployment rockets, the young emigrate. And the debt keeps rising because the new loans are used to make the enormous interest payments to our creditors. The deficits of Greece and other countries of the European South become the surplus of the banks of Germany and other rich countries of the North. Neither wages nor pensions have caused the spiral in debt. This has been caused by large tax cuts and subventions to capital, and the binge on weaponry and pharmaceuticals. They bankrupt us so as to apply more destructive measures and cutbacks, and to sell off the land and public wealth at knockdown price. They must withdraw their memoranda! Get them out! We do not want government by the IMF and the Troika. Nationalise the banking sector. With the bailout plans, the State has already paid above market value so that they can continue speculating. Open the debt accounts to the public so that we know where the money has gone. Radically redistribute wealth and change fiscal policy so that those who pay are those who have the most: the bankers, capital, and the church. We want people’s democratic control over the economy and production. THAT THE AUSTERITY POLICIES UNDER IMPLEMENTATION WILL NOT TAKE US OUT OF THE CRISIS, BUT WILL SINK US INTO IT. THEY ARE DRAGGING US INTO AN EXTREME SITUATION IN WHICH THEY APPLY AND WILL CONTINUE TO APPLY BAILOUTS, WHICH ARE REALLY BAILOUTS TO CREDITOR BANKS, AND THERE WILL BE AN INTENSIFICATION OF GRAVE ATTACKS ON OUR RIGHTS, ON OUR HOUSEHOLDS, AND ON OUR PUBLIC WEALTH. We must show our OUTRAGE and REBEL against these abuses. 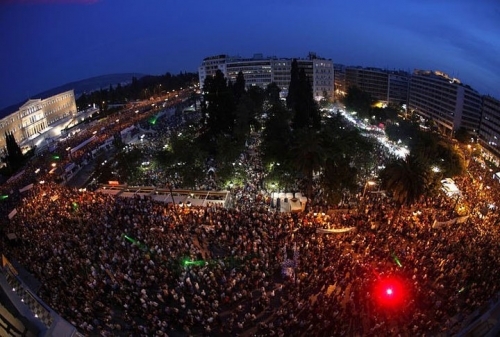 This is what we do from the 15M movement in Sol and from the Popular Assembly of Syntagma. No to the payment of illegitimate debt. This is not our debt . We owe nothing, we are selling nothing, we will pay nothing! For a real and direct democracy NOW! In defence of the public interest. Not a single sale of public property or services. For the co-ordination of all those outraged across all squares. Again, I’m sure this is all a load of nonsense, and the Irish government and advisors like Goldman Sachs grandee Peter Sutherland know just how to get us out of this. And sure if some of those progressives can slip a little advice here and there when they get a little ear time with technocratic elites, then that’s a Brucie bonus.